Blog post and photos by summer intern Mary Dwan. 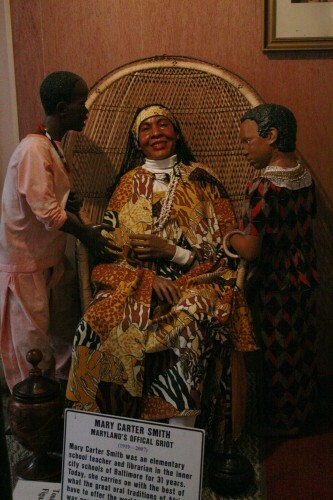 Last week I finally made it to the National Great Blacks in Wax Museum on North Ave, and if you’ve heard of this place but haven’t been yet, or if the name sounds cool to you at all, hesitate no longer. It is an absolutely one-of-a-kind institution and offers a moving, educational experience. One frequent comment I’ve seen in reviews of the Museum is that it’s no Madame Tussauds–I would agree, and add my thanks for that distinction. 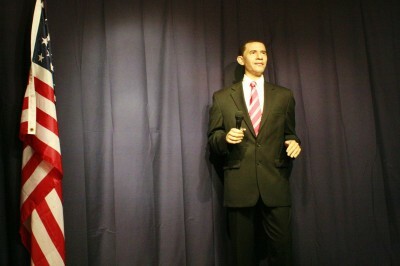 While I enjoy wax museums as a genre (this is my third), I’ve noticed a trend towards accumulating celebrity figures and focusing on mimicry over conveying historical content; when I visited Madame Tussauds (many years ago) I found the displays garish and commercial. 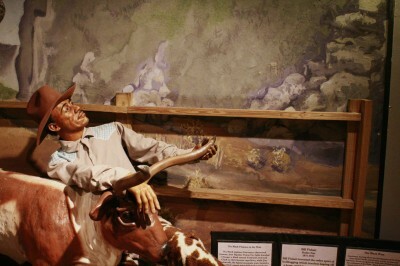 The Great Blacks in Wax Museum benefits enormously from having a historically focused and specific collection, staying true to its original purpose, and embracing local personality. Community outreach is part of most museum mission statements these days, but Great Blacks in Wax displays art from local artists and students, hosts events from baby showers to barbeques, and offers its own catering service to boot. This mood of unpretentious engagement with the community is in keeping with the tone set by the Museum’s founders, Dr. Elmer and Joanne Martin, who purchased four wax figures in 1980, and began setting up small exhibits in schools, churches, and shopping centers. Today, the North Avenue location houses over 100 figures, representing millennia of African American history, from the Queen of Sheba to President Obama. Two pieces in the lobby–a huge sculpture of General Hannibal riding an elephant and first black female pilot, Bessie Coleman, in an airplane hanging from the ceiling opposite–offer a taste of the inventiveness and scope of the collections inside. 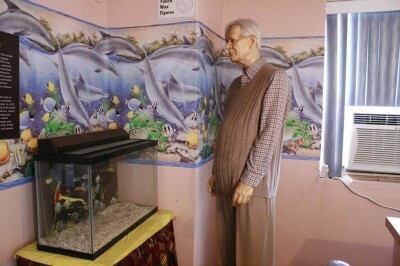 I was most impressed by the diversity of mediums on display and the creativity in the layout. 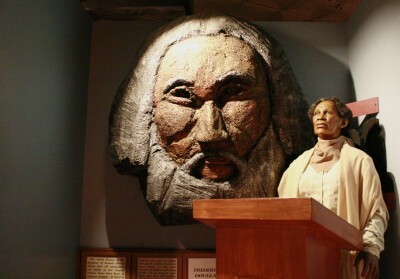 Not all figures are life-size—tiny dioramas in a variety of styles are sprinkled throughout the first room, while icons like Frederick Douglass and Bob Marley are represented as large-scale faces, rendered more artistically than the rest. Some figures move, some are accompanied by audio, others are displayed above the sets, or coming through the walls. A few figures do not depict any specific individual, but stand in for mythological figures or, in one case, a metaphorical representation of substance abuse and addiction within African American communities. In more elaborate displays, one can peer into a model space shuttle containing the first black astronauts, or enter the decks of a model slave ship. This latter exhibit is clearly the most popular and certainly the most affecting, atmospherically. I foolishly visited on a Saturday, just as at least four tour buses were arriving, so trying to navigate the tiny spaces below deck was an evocative experience. 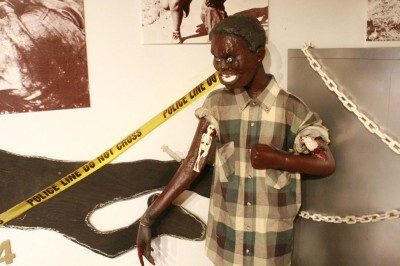 The curators do not shy away from the brutality in African American history, nor do they offer visitors the choice of skipping forward to modern triumphs without first considering the horrors that came before—just inside the entrance is a display on force-feeding and other forms of torture used by American plantation owners. These decisions suggest careful considerations of visitor experience, indications that the Museum takes its education role seriously. The figures are clearly organized chronologically and by subject, but there is a free, democratic quality to the materials on display that I thought endearing and well done. 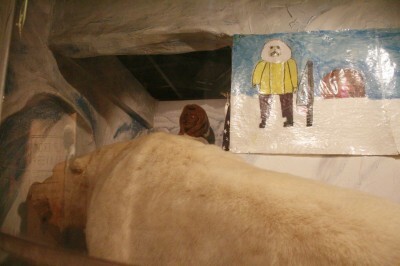 For instance, Maryland-born Matthew Henson, one of the first African American explorers, is displayed with a taxidermied, “world record class” baby polar bear (shot by another black explorer) which, in turn, is accompanied by paintings of Henson reaching the North Pole by Mrs. Russell’s first grade class. The rich history and sense of community imparted by the juxtaposition of these representations became, for me, the more compelling narrative. wax figure of Matthew Henson, who was among the first to reach the North Pole, with artwork by Mrs. Russell’s first grade class in foreground.